Joel Embiid, who’ll make his NBA debut tonight, wants our attention, so badly. He seeks it in many ways: by guzzling Shirley Temples by the syrupy pitcher, by clowning on Andrew Wiggins, or by publicly asking out Rihanna. And we give it to him, maybe a little begrudgingly, because the content is good. 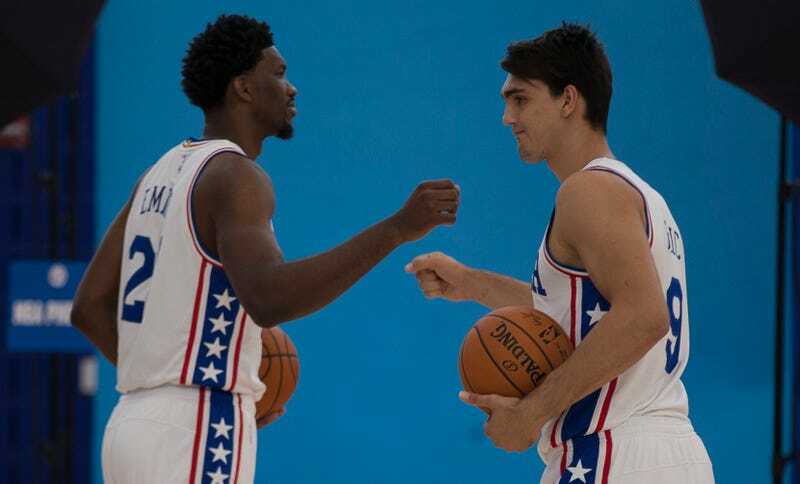 I like to imagine a rehabbing Embiid strolling to a local park with his hands clasped behind his back, observing a few rounds of pickup, mmming in approval whenever a white person spots up. But he said “online.” What could he be watching online? Nah. He said “regular white people,” and Nash is among the greatest shooters in NBA history. So nix Dirk too, or Kyle Korver, or any other legendarily sharp-shooting white guy. Perhaps he watched, over and over again, this clip of Austin Croshere sweetly strokin’ it from just inside the arc. I feel we are getting closer. But even Austin Croshere is still an NBA player. Maybe he stayed up into the wee hours watching this 33-minute video of pickup basketball in London, focusing on the man in the blue shorts. He really lets it rip at 23:37. Still, I’m unconvinced. Maybe he just watched this near-perfect Vine?